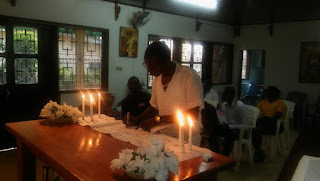 The Community of Sant'Egidio and the prayer. A terrible accident occurred about ten days ago in Cameroon, on the railway between Douala and Yaounde, not far from this city. The last wagons of a train split from the rest of the convoy, hurtling into a ravine. More than 150 deaths were counted. The Yaoundé community gathered in prayer remembering all the victims.